Naval Aviation News. Text digitally removed by author. Power plant 1 2000 hp (1491 kW) Pratt & Whitney R-2800-8 (B) Double Wasp 18-cylinder 2-row radial engine driving a three bladed propeller. The F4U-1A introduced the raised cockpit and clear view canopy. The final F4U-1A production, which received no special model number, upgraded the engine to a 2250 hp (1678 kW) R-2800-8W with water injection. The F4U-1Bs were F4U-1As drawn from Navy stocks for Britain as Lend-Lease. They were fitted with improved landing gear and had 8" (20 cm) clipped from each wingtip to allow the aircraft to fit in the smaller British carrier hangars. The British later claimed the reduced wing area improved stall behavior and roll rate. The F4U-1C was armed with four 20mm Hispano M2 cannon. The F4U-1D was the first fighter-bomber version, with racks for 2 1000 lb (454 kg) bombs or eight rockets and a 160 gallon (606 liter) drop tank. It also replaced the birdcage canopy with a bubble canopy, which greatly improved visibility. The F4U-2 was a night fighter version of the F4U-1 equipped with airborne radar (APS-4 or APS-6). One starboard gun was removed and the loadout per gun was reduced to 250 rounds. About 32 were converted from F4U-1s. The XF4U-3 was equipped with a turbocharger for higher altitude performance, but never went into production. The F4U-4 introduced the 2450 hp (1827 kW) R-2800-18W engine with water-methanol injection driving a four bladed propeller, which raised the maximum speed to 446 mph (718 km/h) at 26,200 feet (7990 m) and the rate of climg to 67 feet per second (20 meters per second). Internal fuel capacity was just 234 gallons (886 liters) but two 150 gallon (568 liter) drop tanks could be carried, giving a range of 1300 miles (2090 km). The F4U-4B was armed with four 20mm Hispano M2 cannon with 924 rounds each. The F4U-4P was a photoreconnaissance version produced in very small numbers. Some 773 other variants were produced postwar, the last being the F4U-7 which was produced until 1953-1 for France. The Corsair was the first fighter in the South Pacific capable of taking on the Zero on equal or better terms, by combining its superior speed, firepower, and protection with hit-and-run tactics. It achieved a kill ratio of 11 enemy aircraft destroyed for every Corsair lost in aerial combat. It also proved to be an excellent ground attack aircraft, capable of carrying a heavier bomb load than many light bombers could at the start of the war. The Corsair design team, led by Rex Beisel and Igor Sikorsky, sought to meet a demanding 1938 requirement for a carrier fighter by building the smallest possible airframe around the most powerful aircraft engine then in production. The result was a rather odd-looking aircraft, with its long nose (built around a massive Pratt & Whitney R-2800 engine and a large internal fuel tank) and inverted gull wings. It was the first American single-engine warplane to exceed 400 miles per hour (644 km/h) when combat loaded, and it had the best performance of any American warplane of the Second World War. The inverted gull wings solved several design problems. With the landing gear placed just inside the low point of the wings, it was possible to get sufficient clearance for the huge (13'4" or 406 cm) propeller without using lengthy landing gear. With the hinge located just outside the low point of the wings, the wings could be tightly folded without exceeding height limitations of carrier hangars. The wing design also reduced drag by allowing the wing root to be perpendicular to the fuselage. Drag was further reduced by using flush riveting and spot welding throughout the airframe and by designing the landing and arresting gear to be fully faired in when retracted. The first prototype flew in May 1940 and showed outstanding performance, prompting an order for 584 aircraft and attracting the attention even of the Army Air Corps. Production began in July 1942. At first, the aircraft seemed be a bust in the carrier fighter role because of its poor landing visibility, its tendency to bounce horrifically when touching down, and its tendency to stall on the starboard wing before the port wing. As a result, most of the early production went to the Marines for use from shore bases, first entering combat in the Solomons in February 1943 with VMF-124. By July all eight Marine fighter squadrons in the Solomons were flying Corsairs. The aircraft proved to have a good rough-field capability, flying from the crushed coral airfields hastily constructed by the Seabees. 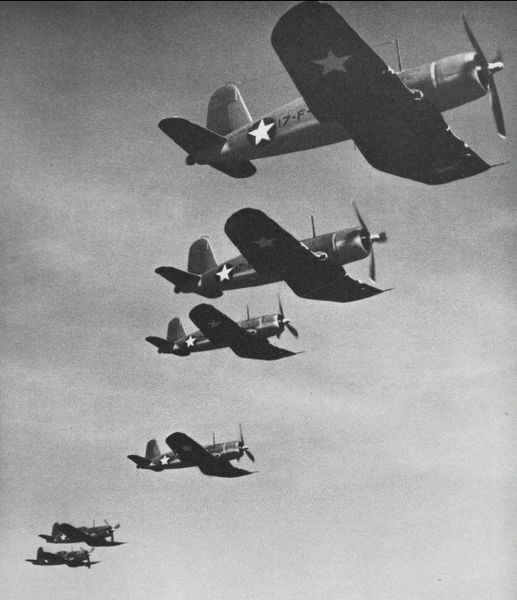 However, Navy pilots who trained on the Corsair in 1943 liked the aircraft and were bitterly disappointed when they were not deployed to carrier air groups, a decision that may have come as much from a desire to simplify the spare parts supply chain as from the easy landing characteristics of the competing F6F Hellcat. By then the stall characteristics had been tamed with a spoiler on the right wing, and the rough landings were reduced by careful adjustment of the oleo struts in the landing gear. Skepticism of the Corsair as a carrier fighter persisted. However, the British Fleet Air Arm received about 2012 Corsairs under Lend-Lease beginning in 1943, more than any other American naval aircraft, and soon proved that Corsairs could operate successfully from carrier decks. British pilots mitigated the Corsair's poor landing visibility by approaching the carrier on a curving path that allowed the pilot to see the deck and the landing signals officer until the last possible moment. U.S. Navy Corsairs from New Georgia provided air cover for the carrier task force that carried out the Rabaul strikes of November 1943, and several of the Corsairs made deck landings on the carriers to refuel and rearm. 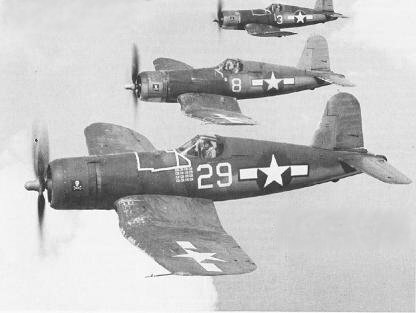 In January 1944 the U.S. Navy finally deployed a small number of Corsairs for carrier service as night fighters. The introduction of a four-bladed propeller on the F4U-4 permitted shorter propeller blades, improving the deck clearance during fast carrier landings, while a longer oleo strut retrofit introduced in early 1944 eliminated the severe bounce on landing. The Navy finally authorized the Corsair for general squadron service on carriers in April 1944. The urgent need for more fighter squadrons to fend off the kamikazes meant that a number of Marine Corsair squadrons were assigned to carrier duty. The aircraft design did not emphasize ease of production, but demand for the aircraft was so great that Brewster and Goodyear began producing the aircraft under license. The Corsair continued to be produced as late as 1952. No warplane would have a longer production run until the F-4 Phantom. A small number of devotees regard the Corsair as the best fighter of the Second World War. Pilots who flew both the F4U and the F6F considered the F4U at least equal in all important respects except visibility and ease of landing. 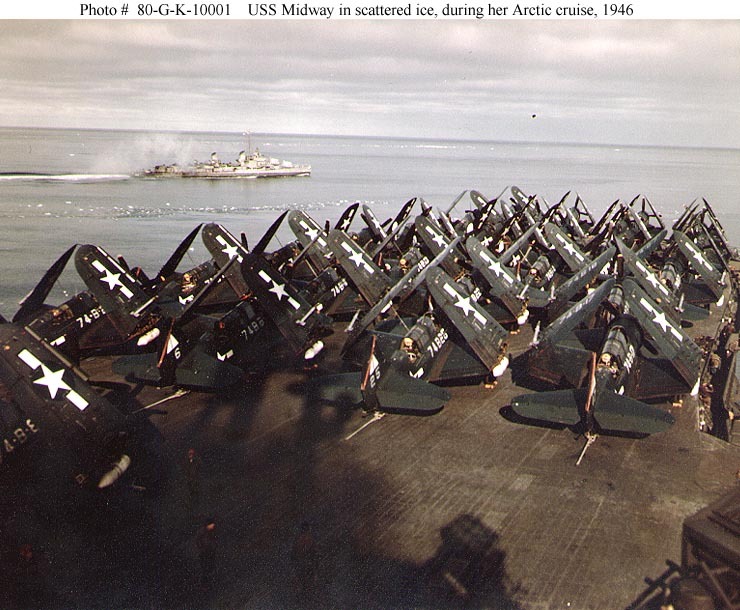 Corsairs could also be spotted more tightly on a flight deck. The Corsair outperformed both the P-47 Thunderbolt and P-51 Mustang at low altitude, but lost its advantage at altitudes above 10,000 feet (3000 meters) and was distinctly inferior above 29,000 feet (6000 meters). The Corsair was significantly faster than the A6M5 Zero at all altitudes and could match its rate of climb, but the Corsair was significantly less maneuverable than the Zero at speeds below 200 knots (230 mph or 370 km/h). However, the Corsair could easily outroll the Zero at high speeds. One weakness of the Corsair was that it was very difficult to pull out of a spin. While their numbers were small, the F4Us caused no trouble. But as their numbers rapidly increased, it ... became impossible to ignore this new fighter. The [attendees] had to admit that at last an American fighter able to match the Zero had appeared. The F4U-2 night fighter was a conversion from the F4U-1, carried out primarily at the Naval Aircraft Factory in Philadelphia. It carried an airborne radar and first saw combat in April 1944 over Munda. Although it was produced only in small numbers, since the radar and other modifications nearly doubled its cost, it put an end to nuisance Japanese night raids ("Washing Machine Charley"). The F4U-2 was operating in small squadrons (4-8 planes) with the fleet by the time of the Battle of the Philippine Sea. 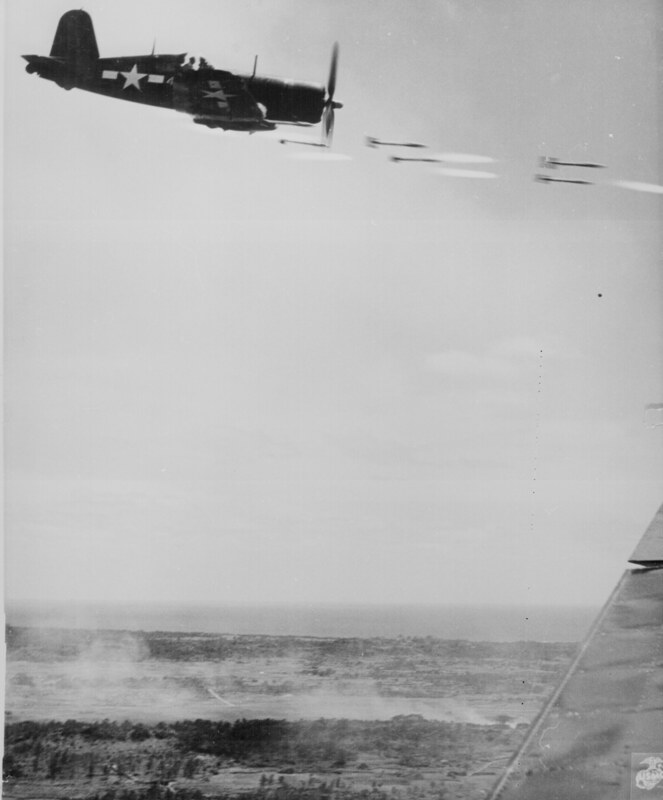 By February 1943 the Corsair squadrons in the Solomons were running out of Japanese air targets. Innovative Navy ground crew of VF-17 improvised centerline racks for 1000 lb (454 kg) bombs. A month later, Marine squadrons in the Marshalls independently duplicated this field modification. It was found that an F4U with its wheels lowered to act as dive breaks made a credible dive bomber, and the factories began turning out the F4U-1D, with a centerline pylon for a drop tank and wing racks for two 1000 lb bombs. Later ordnance options included napalm and the "Tiny Tim" rocket, both of which saw use at Okinawa. The F4U-4 was the final production model. It first saw service at Okinawa. It boosted performance with a more powerful R-2800-18W engine with a two-stage supercharger and more efficient four-bladed propeller. It also had improved cockpit arrangements and an armored bucket seat giving better protection to the pilot. The F4U-4 could carry a single 160 gallon (606 liter) centerline drop tank or two 150 gallon (568 liter) drop tanks under the wings, which allowed the defective and hazardous non-self-sealing internal wing tanks of the F4U-1 to be eliminated. The F4U could also be loaded out as a fighter-bomber with eight rockets or up to 4000 lbs (1814 kg) of bombs.